Hello and welcome to my newest bloggers thank you for following me and I hope you enjoy popping in. There are several challenges that caught my eye and inspired me this month which I would like to join in with and I will list them below, so today I am sharing a card I have been working on for the last few days which dabbles in mixed media something I am fairly new to and always learning mostly by experiments that don't always work lol, but hay ho that's crafting and that's what I love about it. I apologise for the photo's but the last 4 days have been grey and overcast dreadful for photography and to get these I had to balance the card onto a large plant in the conservatory. I started with a 6x6 piece of paper from Tim Holtz paper pad vintage shabby which was a pale greyish colour I covered this in picket fence distress stain to lighten the colour next using a Stencil I applied texture paste and left to dry, now as you know I am not the most patient of people and hate to wait so this part of mixed media - playing the waiting game is hard for me .....soooooooo I got some other craft stash out and made some backgrounds..............much better than doing h*******k while I waited don't you agree lol. Sorry I am rambling back to card or else we will be here all day.........texture paste dry I then dry brushed the paste area with Adirondack paint lake mist, when dry this and other parts of the paper were painted with clear rock candy distress crackle paint I also applied paint and crackle to one of my hearts which I die cut from corrugated card with a Sizzix die (very old have had it years). My second heart cut from card was covered in brushed pewter distress stain using distress ink pumice stone around the edges. Distress inks (as before) were added to all the crackles on my wall and heart, also distress ink pumice stone was added to the distressed edges of the main paper which I tore and curled first. Tissue tape was added to the paper and the heart, chit chat stickers were added to my "wall" firstly the edges distressed with pumice stone. Next step I made my card blank in white card and stamped the lovely distress corners one of my fav stamps from the Tim Holtz visual artistry collections range of stamps , using distress markers in the same colours as above inks and the spritzer tool these were added in various places on the card edges also onto the main paper, I also added some black soot very liberally. This done the main paper was attached to card blank and I added very small buttons to the burlap flowers and added knots of twine, the wooden word "love" was distressed with tea dye distress ink and an Idea-ology metal tab (precious) was added beneath the heart. again sorry for the greenish tint on the photo really wish the sun would shine here soon! Phew hope you managed to stay with me through this long post, as I mentioned at the beginning several challenges inspired me to make this card, I really enjoy the challenge of mixed media which I am always nervous about but have come to the conclusion the only mistakes are learning curves lol. Distress Inks/distress markers pumice stone, tea dye, black soot. Distress stains picket fence/brushed pewter. Paper pad, Idea-ology, Distress crackle paint clear rock candy, Tissue tape, Stamps Visual Artistry Collections, Spritzer, chit chat stickers, Ranger Adirondack Paint Dabber lake mist. Maggie , I am loving your mixed media page ! I have also become your latest blog follower. This is lovely! Thanks for joining us at the Take It Make It Challenge. A beautiful card, wonderful textures and soft colours. Thank you for joining us at the ATP Exchange this time. Oh I love this Maggie, - you do mixed media brilliantly well!! This looks fantastic!! 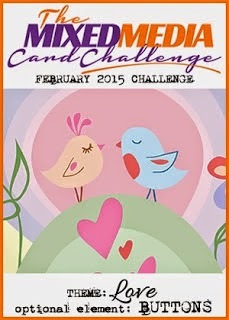 Thanks so much for adding this to our challenge at A Vintage Journey! I love the layered hearts and that wonderful textured brickwork with the words patchworked into it. I think it's a brilliant mixed media card, Maggie. Thanks so much for joining us on A Vintage Journey. Love the curled edges, all the textures and the brick in your wonderful variety of natural earth tones Maggie! Thank you for joining in the AVJ challenge! Another beauty Maggie, such a beautiful piece. Thanks for sharing it at AVJ. Very pretty. I really like the added chat stickers to emphasize the love theme. Thanks for joining us this month at the MMCC. This is so very pretty, love the brick BG :) Thank you for sharing with MMCC!